HOUSTON (KTRK) -- Thieves smashed their way into both a washateria and a convenience store in northwest Houston. The first burglary happened around 5am Friday at the laundry business off West Little York near the Gulf freeway. Police say four men in hoodies slammed their white Durango into the building and managed to steal $300 in cash. Surveillance video shows the thieves trying to cover their faces with their hoodies. The suspects also broke the glass door to the office where the register and safes are kept. The owner of the washateria said his work van was stolen Thursday. About half an hour later around 5:30am, security video shows the same group with the same SUV -- this time with a broken rear window -- slamming into a convenience store on Airline Blvd, a few blocks away. Security video shows these same men climbing the counter at CJ's Mart, grabbing a trash bag and filling it with stolen items. 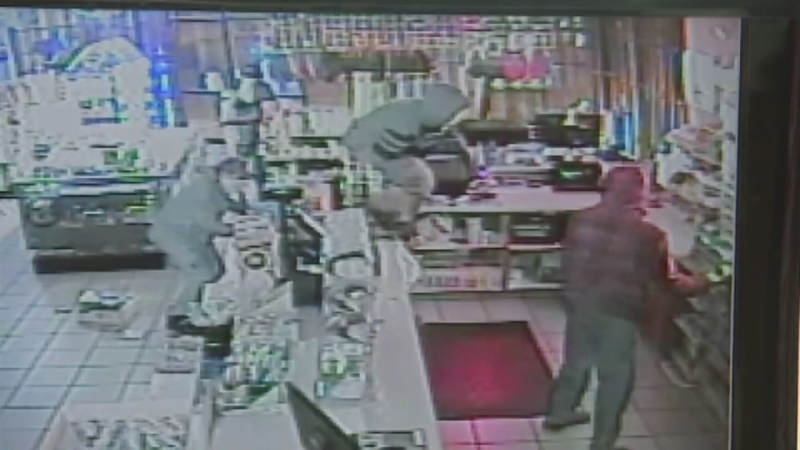 The store owner said the suspects made off with cigars, cigarettes, and about $350 in change. "It's not right. You know, we are small business owners. We are sustaining very hard right now. It's hard times for the business," said Naeem Sadruddin, the owner of CJ's Mart. The damage left behind by these suspects will cost the owners thousands.